Lathan Goumas - lgoumas@shawmedia.com Michael Metz, 8, of McHenry races down Waukegan Road during the 2013 McHenry Soap Box Derby down Waukegan Road in McHenry, Ill. on Saturday, June 8, 2013. "I just like to see how fast the world goes by," said the first time racer. 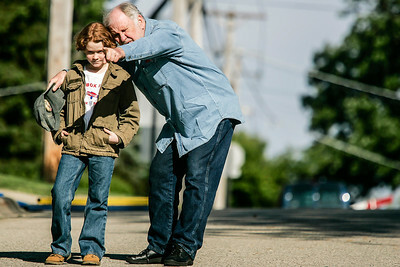 Lathan Goumas - lgoumas@shawmedia.com Justin Bender, 12, of McHenry, and his car sponsor Joe Ferguson survey the race course before the 2013 McHenry Soap Box Derby down Waukegan Road in McHenry, Ill. on Saturday, June 8, 2013. Bender participated in the race for his fifth consecutive year. 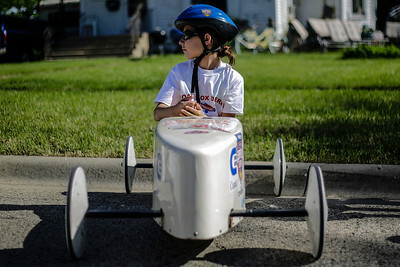 Lathan Goumas - lgoumas@shawmedia.com Abbey Bratek, 10, of Johnsburg waits for the start of the 2013 McHenry Soap Box Derby down Waukegan Road in McHenry, Ill. on Saturday, June 8, 2013. 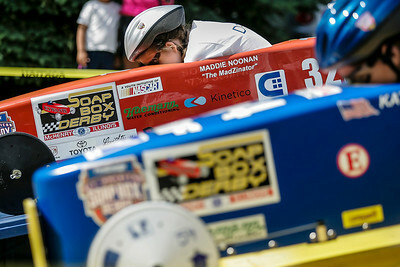 Bratek participated in her first soap box derby race. Twenty-four racers competed in the double elimination annual event. 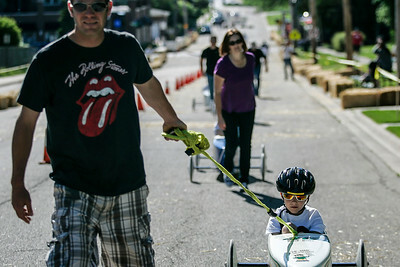 Lathan Goumas - lgoumas@shawmedia.com Wriglee Bucaro, 8, of McHenry is pulled to the top of the hill on Waukegan Road by his father Ryan Bucaro before the start of the 2013 McHenry Soap Box Derby down Waukegan Road in McHenry, Ill. on Saturday, June 8, 2013. Many racers were pulled to the top of the hill by family members. Lathan Goumas - lgoumas@shawmedia.com Anna Karcz, 11, of McHenry sift by her car prior to the start of the 2013 McHenry Soap Box Derby down Waukegan Road in McHenry, Ill. on Saturday, June 8, 2013. Karcz said she plans to begin racing go-karts after this year. 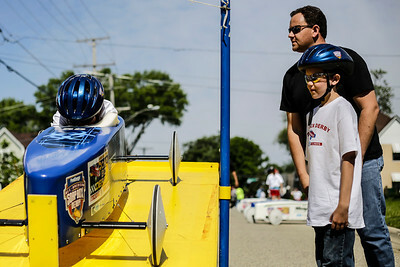 Lathan Goumas - lgoumas@shawmedia.com Maddie Noonnan, 12, of Wonder Lake, sits ready in her car on the starting ramp during the 2013 McHenry Soap Box Derby down Waukegan Road in McHenry, Ill. on Saturday, June 8, 2013. The sophomore racer said she hoped to improve on her speed this year. 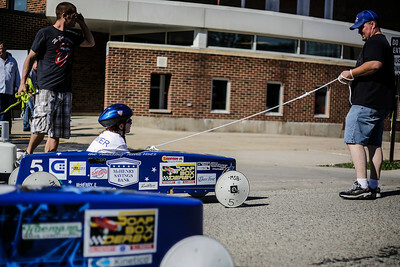 Lathan Goumas - lgoumas@shawmedia.com Alivia Hintz, 9, of Johnsburg, is pulled up the Waukegan Road to the race start by her father Jason Hintz before the 2013 McHenry Soap Box Derby down Waukegan Road in McHenry, Ill. on Saturday, June 8, 2013. Racers were pulled to the top of the hill for the parade before the race began. 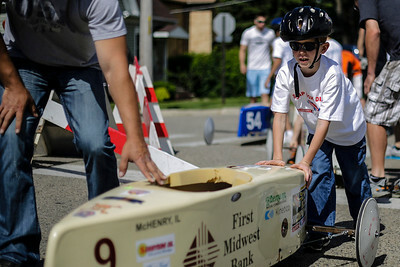 Lathan Goumas - lgoumas@shawmedia.com Michael Metz, 8, of McHenry pushes his car towards the starting ramp during the 2013 McHenry Soap Box Derby down Waukegan Road in McHenry, Ill. on Saturday, June 8, 2013. Lathan Goumas - lgoumas@shawmedia.com Devon Fuller, 9, of McHenry crouches into position in his car as his father Dave Fuller and older brother Jacob Fuller, 11, look on during the 2013 McHenry Soap Box Derby down Waukegan Road in McHenry, Ill. on Saturday, June 8, 2013. Lathan Goumas - lgoumas@shawmedia.com Devon Fuller, 9, of McHenry crouches into position in his car during the 2013 McHenry Soap Box Derby down Waukegan Road in McHenry, Ill. on Saturday, June 8, 2013. 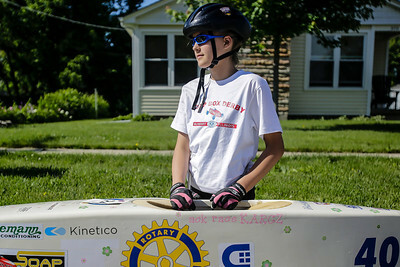 Abbey Bratek, 10, of Johnsburg waits for the start of the 2013 McHenry Soap Box Derby down Waukegan Road in McHenry, Ill. on Saturday, June 8, 2013. 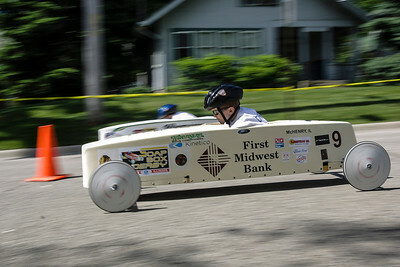 Bratek participated in her first soap box derby race. 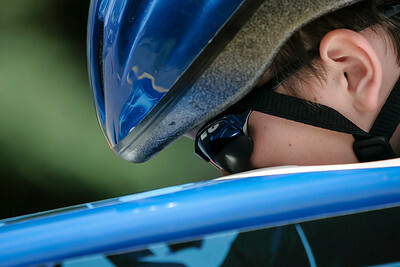 Twenty-four racers competed in the double elimination annual event.